Another example of monochrome watercolour and photoshop colouring. It's amazing how much better the designs have become over the years. They sure have, come a long way haven't they? Awsome! The first Cybermen, althrough the most simple, are the most distubing to me. I always found the original cybermen design (the very first from the tenth planet) to be the worst iniration, I can understand they were working with what at they had at the time it was there first cybermen, but it looks kinda laughable as it comes off as a guy wearing cloth, you can see a human mouth beneath the clothand even see the hands look very human still. The reason they look human is because they are, for the most part, still human, which is what makes them so disturbing to so many people... they're creepy than NuWho's big, stompy toy robots, you have to admit. Oh man, this is fantastic! Really great! Earthshock Cybermen + Age of Steel Cybermen are the BEST! Awesome. 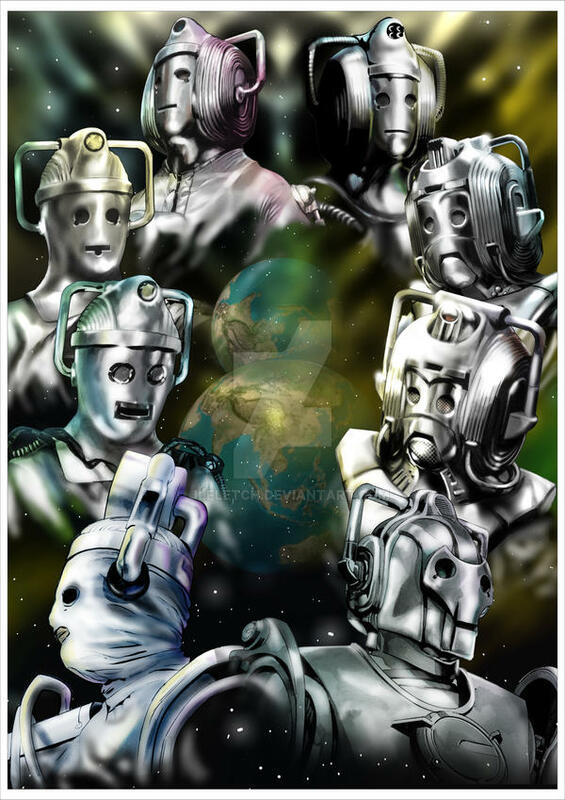 All incarnations of the Cybermen race in one excellent work of ilustration. The visuals sure capture the likeness of the IDW Publishing "Doctor Who" comic covers well. The cybermen are my favorite villains of the doctor who series. It's a fez, I wear a fez now. Fezzes are cool. This is so awesome! I'm more a fan of the new Cybermen, but still, awesome! The new ones are sooooooo much better. XD Great job. Great pic,the Doctor has had many faces,and so has the Cybermen. I far prefer the new Cybermen in design but there was something more joyous about watching some of the old ones and they weren't going 'deleeeete' all the time. I really liked the current Cybermen in the recent christmas episode. I want the Cyberking as a figure though probably not to correct scale to the others as it would likely not fit in my home. At first I thought it was a photo, but then i looked at full size and realized it was drawn. That's amazing! That's... awesome. They should ease off the Daleks a little, because, like the Borg in Voyager, they loose their menace if you see them too much. Less is more, after all. Ahh, you've gotta love the classics. The earlier stages lookes ridiculous XD. I have a soft spot of the earlier one. wearing RTD Cybermen. Damn usurpers!! that would be an intersting episode actually! I don't mind the RTD Cybermen, however I would love to see the originals reappear. Oh wow! Is that ever cool! I was watching Tomb of the Cybermen over the weekend, so this is very à propos. I had never really realized just how much the design had changed over the years. They are the only monsters in Dr Who ever to change. the fact their involvement in the story was a secret right up until the end of part one. As a twelve year old, it was the event of the century in my school the next day. Cybermen are the best!! great work!